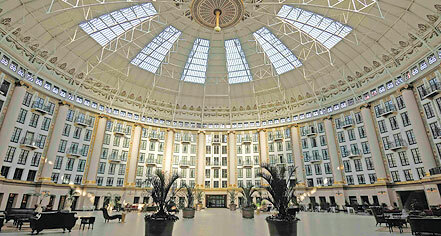 An architectural marvel, West Baden Springs Hotel is the crown jewel of French Lick Resort’s $500 million restoration. The turn-of-the century National Historic Landmark offers 243 exquisitely appointed rooms, a world-class spa, championship golf, and a wide array of dining and entertainment options. Experience the luxurious European spa hospitality that drew in the social elites of the early 1900s. Less than a mile from the French Lick Springs Hotel, West Baden Springs Hotel was first built by a young upstart named Dr. John A. Lane. He had spent some time at the French Lick Resort, leasing some space from French Lick Hotel owner, Dr. William A. Bowles. He learned the ins and outs of the hotel business and upon purchasing land of his own, he thought, "What's life without a little bit of competition?" The West Baden Springs Hotel features six circular stories with 243 guestrooms and suites, including 36 Balcony Rooms that offer spectacular views of the atrium. The two-level natatorium features a 12,000-square-foot indoor pool and an 8,000-square-foot spa with 12 treatment rooms, relaxation rooms, and a state-of-the-art fitness center. West Baden Springs Hotel was awarded Best Historic Hotel (201-400 Guestrooms) for the 2017 Historic Hotels Awards of Excellence. West Baden Springs Hotel, a member of Historic Hotels Worldwide since 2015, dates back to 1902. Cancellation Policy: Cancellations must be made 24 hours prior to arrival to avoid penalty of one nights room and tax. In the case, of Pre-paid, non-refundable rates, Full, non-refundable prepayment of room and tax due at the time of booking. Deposit: In the case of Pre-paid, non-refundable rates, full, non-refundable prepayment of room and tax due at the time of booking. All reservations require credit card guarantee at the time of booking. Early Check-In/Late Check-Out: Based upon availability. Extra Person Fees: No charges for extra adult or child. Hotel/Resort Fees & Taxes: All reservations are subject to a City/State Tax of 13%. Pet Policy: Service animals allowed: Yes. Pets allowed: Yes. Dogs and cats. Deposit: $75 (Non-refundable). Maximum size: Dogs up to 75 lbs and de-clawed cats. Maximum amount: 2 pets per room. Amenities: Walking trails. Other: Pets must be in a crate when left unattended in room. Pets must be on a leash or in carrier when in common/public areas. A cell phone number must be on file at front desk. Pet owner is responsible for the cost of any damages or extra cleaning fees that are caused by the pet. Pet friendly rooms are limited, please contact the front desk for availability. Pets are not permitted in food and beverage outlets, pool areas or spas. Shuttle Service: Free shuttle service to resort venues. Smoking Policy: Non-smoking property. Designated smoking areas. 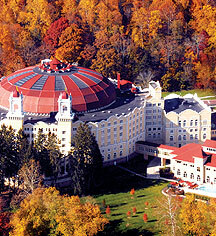 An architectural marvel, West Baden Springs Hotel is the crown jewel of French Lick Resort’s $500 million restoration. The turn-of-the century National Historic Landmark offers 243 exquisitely appointed rooms, a world-class spa, championship golf, and a wide array of dining and entertainment options. Learn more about the History of West Baden Springs Hotel .